Here's the view out the front of the our AWD car on the ride back from our rented country house in Joanopolis. I mention the AWD because you're really going to want to have one if you ever visit us there. Unless you feel lucky. This photo is from about 5 minutes down the gravel and dirt road, and before things start to get hairy. As in lumps and bumps and holes that have swallowed small goats. 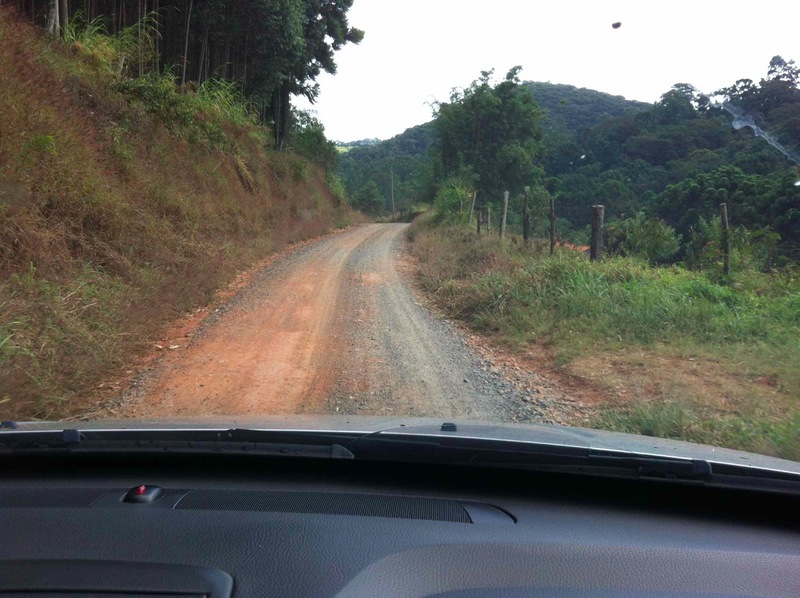 The dirt road from the fazenda (ranch) house to the asphalted main road to Joanopolis is 27 km. On one side there is pretty much a constant wall of earth, frequently topped by rows of eucalyptus trees. The other side generally has a sharp drop-off to lower fields and farms. The turns are hairpin and the source of constant terror to me as we frequently meet enormous flatbed trucks carrying huge tree trunks. On my last solo trip to the fazenda (not a trip I relish--3 hours with two crabby boys) I was stuck for 15 minutes as two tree trucks met and had to maneuver carefully past each other by shutting side view mirrors and clearing an electric pole by one inch. I closed my eyes as one truck leaned precariously to one side--the side with the free fall drop 70 feet to certain death. Not all cars are four-wheel drive. The most common car on the dirt and asphalt roads of Joanopolis is the Fusca, or the VW Beetle. Old, creeky, rusty, marvelous. I say marvelous as they seem to be able to get through the muddy season swamp and the dry season ruts. There are so many Fuscas in Joanopolis that I often refer to it as "Fuscopolis"--my record on one trip through town was sighting 52 Fuscas (in a town of 12,000 people, that's pretty impressive in an afternoon). During the rainy season, the roads are awash with mud, and there have been minor landslides in the area. Especially where neighbors have cut the eucalyptus. Friends have gotten their small Peugeut stuck--a friendly local truck driver helped them push it out. A couple of friends have simply not shown up when they turn back. One spent the night in his car when he got stuck late at night. Since there is no phone service or cell phone service at the ranch, we have to just assume the best. Yes, we are Brazilian--we assume the best.